I have a date tonight with some Delta Gamma. I guess I can be a little more specific than that. She is the same flaxen haired little lass that I had out last Sunday night. I wish that I didn't have the date now. In fact the way I feel today I would just as soon not have anymore dates ever. I seem to be pretty moody about going out with girls. I suppose that is due to the fact that I never find anyone with whom I really want to run around. Oh well, so it goes, now up and now down. Bob Hogan is coming down tonight from Cedar Rapids, and we plan to go out to the Amanas for supper. Will be glad when 10:30 rolls around, and I can fall into bed for some protracted sleep. Ben and I weren't able to get together in Chicago. He left me a note at the Morrison saying that he had to pull out on Friday. I shall be interested to hear if he had a good time while he was in there. 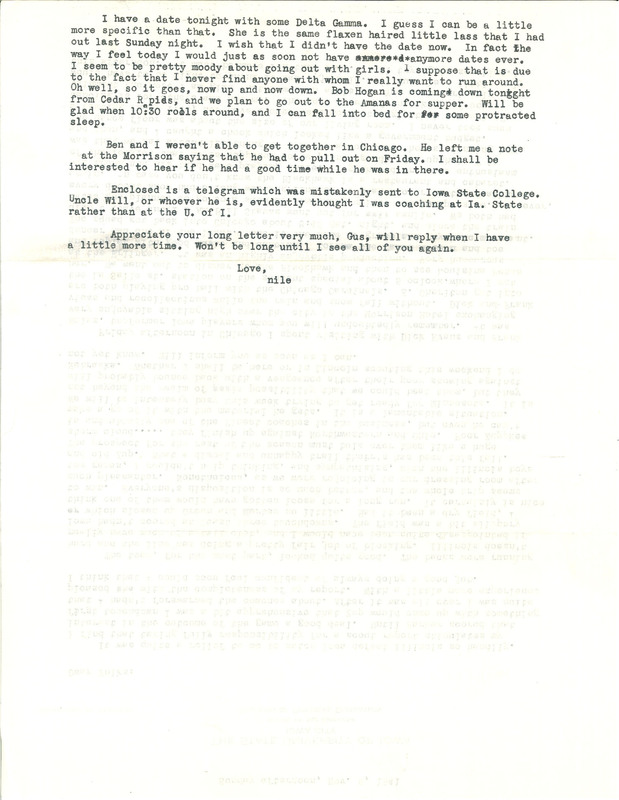 Enclosed is a telegram which was mistakenly sent to Iowa State College. Uncle Will, or whoever he is, evidently thought I was coaching at Ia. State rather than at the U. of I. Appreciate your long letter very much, Gus, will reply when I have a little more time. Won't be long until I see all of you again. Love, nile .